Dragon® Medical Practice Edition 2 is the leading speech-recognition software available today and it's changing the way physicians practice medicine for the better. By increasing efficiency, streamlining workflows, and hastening reimbursements, Dragon Medical Practice Edition 2 has something for most members of your medical practice, from physicians to administrators to support staff. Spend more time with your patients, providing quality patient care, and less time in front of a computer, inputting notes and client information, using the best in speech-recognition software today, Dragon Medical Practice Edition 2. Customization options, like custom macros and templates, save you time and give you the freedom to create shortcuts for the words and phrases you say the most. Dictate fully HIPAA-compliant patient records, assessments, treatment plans, and notes on the go, even using your iPhone or Android device, and upload them from anywhere, including from a computer that doesn't have the software. 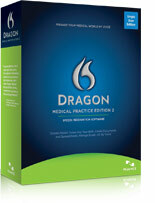 Dragon Medical Practice Edition 2 is the most widely used speech-recognition software available today because it is designed specifically for medical practices and because it is so easy to use. This revolutionary speech-recognition software is giving physicians more time for patients, and freeing up support staff so they too, can focus on more valuable tasks, like billing and organizing patient documentation. With the government mandates that require medical practitioners to make the switch to EMRs, there is no better time to implement Dragon® Medical Practice Edition 2 into your medical practice than now.